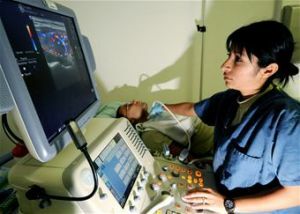 According to most experts,employment opportunities in sonography are extremely favorable for at least the next decade. Currently, the industry is experiencing faster than average growth. There are several reasons for this growth. First of all, the health care industry in general is growing. Second of all, sonography in particular is growing due to technological advances in equipment and due to the fact that many people see it as a safe alternative to many procedures that currently rely on radiology. As of the year 2008, there were approximately 50,300 sonography jobs in the United States. These professionals are referred to as diagnostic medical sonographers or ultrasound technicians. Their primary duties include using sonography equipment to create sonic images of people’s internal organs. Approximately fifty-nine percent of these professionals worked in hospitals while the other forty-one percent worked in private physicians’ offices, out-patient care centers, and diagnostic laboratories. In the media, the most popular images of these professionals are the ones who do ultrasounds for pregnant women. However, the field actually encompasses much more than that, and it is quickly changing. For instance, diagnostic sonographers can specialize in the abdomen, the breasts, the nervous system, the cardiac system or the vascular system. As technologicaladvances change ultrasound or sonography equipment, the field will grow, and sonographers will be able to choose from a longer list of specialties. As the equipment changes and advances, it will be able to take images of body parts that it currently can not. In addition, these technological advances will also make the equipment cheaper. As it becomes more affordable, it will become easier for smaller offices to purchase. Thus, as years pass, fewer sonographers will work in hospitals, and a larger portion of them will work in doctor’s offices and outpatient clinics. As these changes impact the industry, the employment opportunities in sonography will grow. Most projections estimate that the field will see approximately eighteen percent growth by the year 2018. This growth means that by that year, there will be just fewer than 60,000 jobs in the field. Employment opportunities in sonography offer potential applicants a fairly lucrative salary range. The median yearly wage of these professionals was just under $62,000 in 2008. In that same year, the middle fifty percent made between $52,500 and $73,700 per year. Even the low end of the wage spectrum is attractive as the bottom ten percent made approximately $43,500 in 2008. The highest ten percent made almost double that figure. The wage differences between those people who worked in private offices and those worked in hospitals was less than $1,000 per year.